If you want to build your email list, you need a way to ask the right people to join your list at the right time and place. Makes sense, right? You’re not going to build a list without asking. And you want to ask when a visitor is most receptive to joining your newsletter. 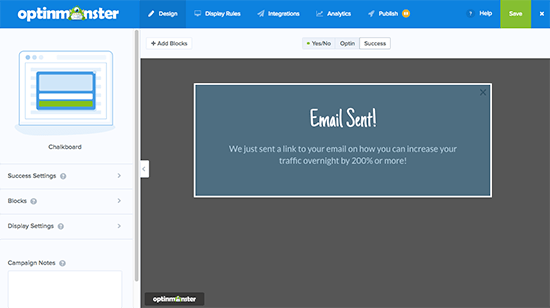 To accomplish all three things at the same time, you need a tool to help you create and display emails opt-ins. OptinMonster is one of those tools. 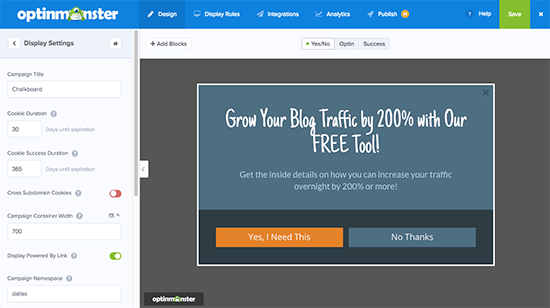 In my OptinMonster review, I’ll single out some especially powerful features of this list building tool. 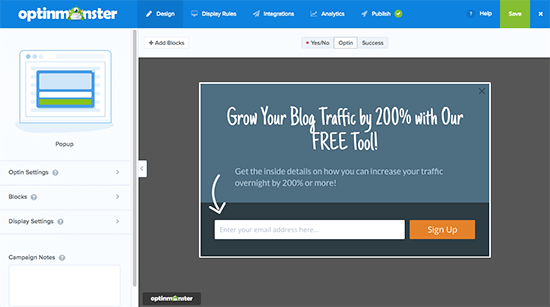 Then, I’ll go more in-depth and show you exactly how OptinMonster works to help you create, target, and manage your email opt-ins. I’m going to show you the entire OptinMonster interface in the next section. But to start, I want to single out some specific areas where I think OptinMonster excels in comparison to other tools. The first thing I love about OptinMonster is the interface. It makes creating your opt-ins much easier than many other tools I’ve tried. Despite being a single interface, it never feels cluttered and you don’t sacrifice any functionality. I don’t think there’s any argument that, contrasted with something like Thrive Leads (a popular comparison), OptinMonster’s interface is more straightforward. 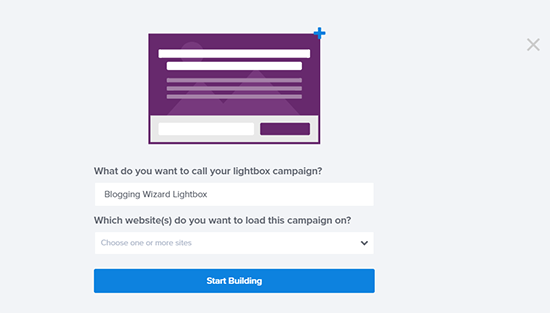 If you want to experiment with opt-ins beyond the industry-standard lightbox popup, OptinMonster gives you tons of options. You can go super aggressive with popups or fullscreen fillers. Unless you’re already a designer, there’s a good chance that staring at a blank canvas fills you with a deep sense of dread (maybe I’m projecting, but that’s how I feel!). That’s why I love templates. 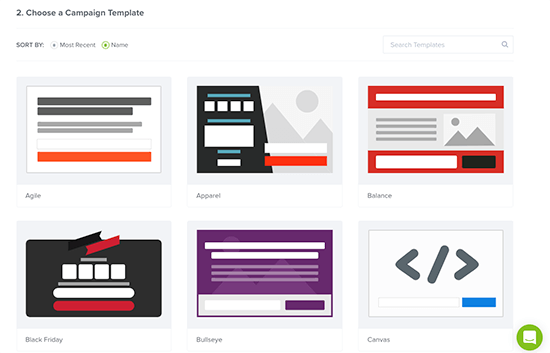 And when it comes to templates, OptinMonster doesn’t disappoint. Then, you just customize the text, colors, and images using the simple visual editor and you’re good to go! That’s a lot better than trying to build everything from scratch. One of the areas where OptinMonster especially excels over other opt-in tools is its detailed triggering and targeting rules. And the really neat thing is that you can set up multiple display rules for each campaign and even A/B test different display rules against one another to find the combinations that work best. 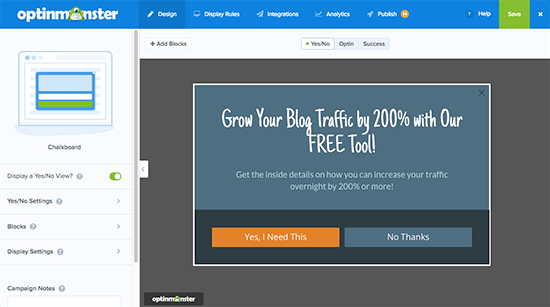 Because OptinMonster is a cloud SaaS tool rather than a WordPress plugin, you might be a little worried that OptinMonster will be hard to integrate with WordPress. OptinMonster actually started as a WordPress plugin, and the developers certainly haven’t forgotten their WordPress roots. 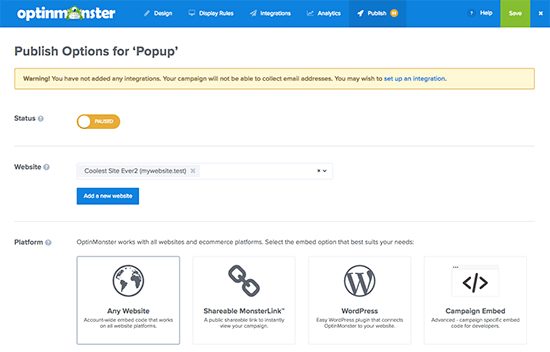 OptinMonster offers a dedicated WordPress plugin that lets you manage your campaigns right from your WordPress site’s dashboard. It’s super simple and, apart from the fact that you’ll still need to actually create opt-ins in the cloud interface, you’d never realize that OptinMonster wasn’t a dedicated WordPress plugin. A/B testing is a powerful tool that helps you improve the effectiveness of your opt-ins by allowing you to test two or more variants against one another to see which performs best. 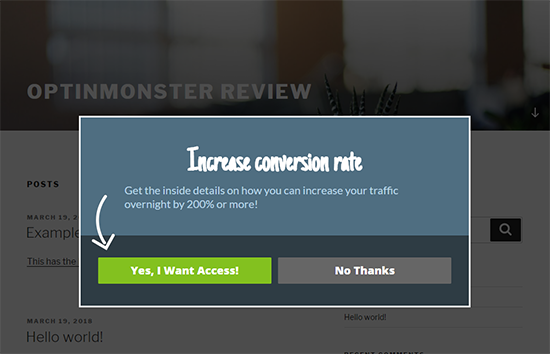 OptinMonster makes it easy to create A/B tests for your opt-ins right your dashboard. It only takes a few clicks and you’ll be able to test all aspects of your opt-ins, including different triggers and targeting. The only feature missing here is “Automatic Winner” functionality. With such functionality, you’re able to set criteria to automatically declare the higher-performing opt-in the winner. 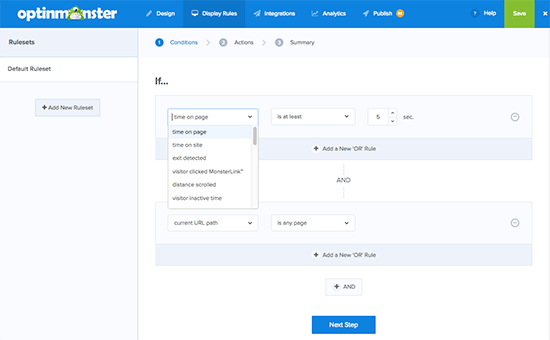 While it’s not a dealbreaker to skip this functionality, it does make things a bit more hands-off and Thrive Leads, one of OptinMonster’s competitors, does offer this feature. This one won’t apply to everybody. But if you run multiple websites, the fact that OptinMonster is a cloud tool rather than a WordPress plugin is going to make your life a lot easier. See, with a WordPress plugin, you have to log in to each site’s dashboard to manage its opt-ins. That wastes time. That’s going to make your life a lot more convenient if you’re already struggling to manage multiple websites. To show you those features in action, I want to go through a brief tutorial on how you actually create an email opt-in with OptinMonster. I’ll splice in my own thoughts, as well, to keep things interesting. You can, and likely will, have multiple campaigns running on a single site, especially if you’re promoting different offers for different pieces of content on your site. Then, depending on what campaign type you selected, you can Choose a Campaign Template. You have a good variety of options. 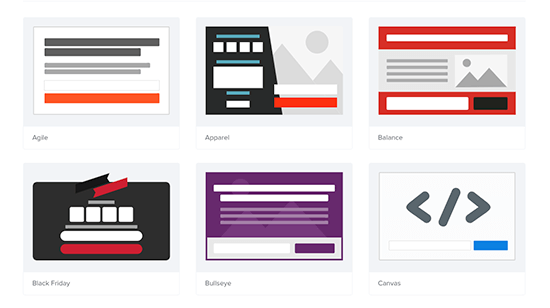 For example, the lightbox popup campaign type generates 25 different templates. And you can, of course, always start from a blank slate. Once you finish those steps above, OptinMonster will take you into the editor. Beyond that helpful feature, there are seven different tabs where you can configure your opt-in form. I’ll go through each below. The main thing that you’ll want to do in the Display Settings tab is configure the Cookie Duration. 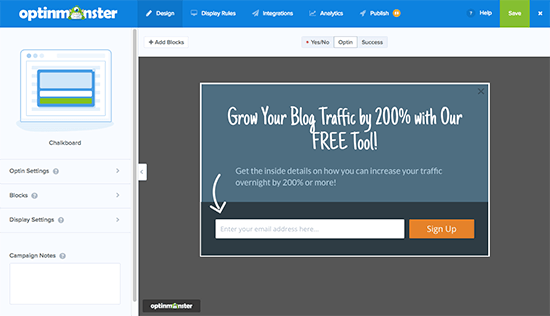 This feature is pretty standard for an opt-in tool, but it is essential to use so that you avoid annoying your visitors with repetitive popups. The Optin tab is where you can configure most of how your opt-in form looks. The Yes/No tab is a super simple section that lets you easily enable a negative option opt-out/2-step opt-in. These forms can harness something called the Zeigarnik effect to boost your conversion rate. Personally, I find these forms obnoxious when they go too negative with the “no” button (funny examples here). But done right, they can definitely be effective. And OptinMonster has plenty of examples of how to do it right. 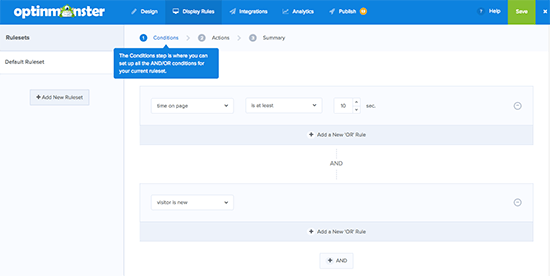 The Display Rules tab houses some of OptinMonster’s most powerful features. Exit-Intent – this is one of OptinMonster’s most well-known features because they trademarked it. Based on user’s local time (e.g. 2:15 PM)- this is a unique trigger that I’ve never seen before. Definitely a niche one, but there are some cool uses for time-sensitive offers. You can create multiple rulesets for a single campaign, which is something most other tools don’t let you do. 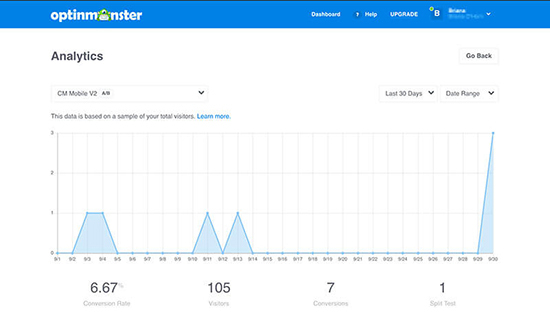 Finally, the Analytics tab lets you connect your OptinMonster account to Google Analytics to set up tracking. It’s a bit odd that OptinMonster forces you to connect to Google Analytics to view data when pretty much no other tool does it this way. But given that most webmasters are probably using Google Analytics nowadays, I don’t see this as a significant drawback. Once you’ve finished configuring your form, you click the Publish button in the top right corner. While you can embed OptinMonster on any type of website via a code snippet, there’s also a dedicated OptinMonster plugin that makes the process super painless. To use the OptinMonster plugin, you just enter your API key (which you can easily create in your OptinMonster account). And then your popup will start displaying! Once your campaign is live, you can still perform some other useful actions from the campaign management area. What’s helpful is that you can test everything. Which means beyond basic text changes, you can also test how different display rules affect your conversion rate. How much does OptinMonster cost? OptinMonster currently offers four different paid plans. Unfortunately, there’s no free version of OptinMonster. Plans start at $9 per month ($108 billed annually) and range up to $49 per month (billed annually). Each plan offers a different feature list and not all of the features that I discussed in this post are available in the cheapest tier, so definitely pay attention to the feature list if a specific feature was what piqued your interest. It’s also worth noting, their is now a page view limit in place that increases with each plan. Should you use OptinMonster on your site? 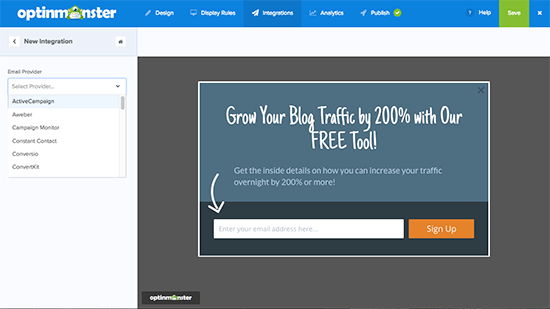 OptinMonster isn’t the cheapest way to build your email list with opt-ins, but it is one of the most powerful and flexible. If you have the budget for it, I think OptinMonster has one of the best feature sets that you’ll find. And the fact that you can manage all of your sites from one place makes it really convenient for busy webmasters running multiple sites. If, on the other hand, you’re on a tight budget, then you might be better off with something like Thrive Leads. While Thrive Leads requires you to manage each site separately and lacks some of the more advanced targeting/trigger functionality, it’s also a one-time fee for lifetime updates, which makes it cheaper over the long haul, especially if you’re only running a single website. It’s also pretty dang powerful in its own right! Summary: OptinMonster is a powerful, though potentially pricey, lead building tool that gives you plenty of features to display conversion-friendly forms to the right visitors at the right time and place.